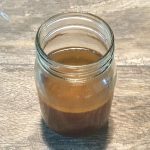 When I started this blog six years ago, if someone had told me that one day I’d publishing a blog post about how to make your own beef bone broth, I would have told them they were crazy lol. But a lot has changed since then and with the all of the recent hype about the benefits of making your own broths, I had to give it a try. I make chicken broth all the time. This post is the first time I’ve ever made beef broth. I wanted to share the simple steps I took to make the broth and interesting facts I learned along the way that you may or may not find interesting, too. Making your beef bone broth is not difficult! I always felt this way until I tried making it myself. It’s probably because growing up my mother NEVER attempted to make homemade beef broth. We always used store bought or beef bouillon and water in recipes that called for beef broth. Turns out it’s actually pretty easy to make, and the results are better than anything you can find in the store. Still not convinced? Some people say beef bone broth is a superfood. It helps heal your gut, improves your immunity, and even keeps your skin looking younger. Collagen: Our bodies are made up of a lot protein. Most of this protein is collagen protein, which is found in our hair, our muscles, our bones, our skin, and our organs. It’s everywhere. Helping the production by consuming collagen protein may over time help our bodies rebuild and repair our tissues faster. Glutamine: This is an amino acid. Studies of burn victims have found that it helps to preserve tissue. Proline: Another building block of life. It helps form collagen throughout the body, improving hair, skin, and nails. Even the lining of our stomachs and intestinal tract benefited from this. Glycine: Just like above, this is another nutrient that plays a key role in helping support the process of healing and support. I could probably go on with this section for a very long time. It could honestly be a completely different post. Just remember this – bone broth is very good for our bodies. Yes. 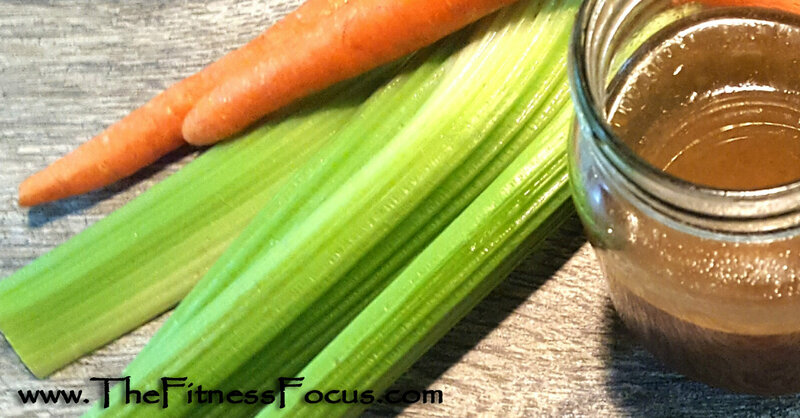 Beef broth is allowed on the 21 Day Fix. 8 cups beef bone broth = 1 red container. With that being such a large amount of broth that you probably wouldn’t consume on your own, I wouldn’t count it as anything and just consider it a free food. Beef bone broth is also allowed on the 2B Mindset program and all of the other workout programs I’ve seen from Beachbody. I’m not into adding lots of ingredients to my broths. The main ingredient is the bones. Since you will be slowly cooking the nutrients out of these bones, the one suggestion I have is to use the bones from grass fed cows that are not treated with antibiotics or growth hormones. For the vegetables, you can freeze kitchen scraps in a gallon-sized freezer safe bag and use these. The only vegetable I believe you really need for this broth is onion. The celery and parsley add a nice flavor along with added vitamins and minerals. Carrots add a sweetness you may or may not care for, so experiment if you want to find our what you like best. The best way to preserve broth is in the refrigerator for 3-5 days. If you decide to freeze it, I like to use a large mouthed 1 gallon mason jar. You can store it for up to 3 months this way. Let the broth cool overnight in the fridge. I also refrigerate the mason jars that I’ll be using at the same time. Ladle the broth into the mason jars with a funnel. Begin sure to fill it only about three quarters of the way. Label with the name and date and freeze until needed. To thaw frozen beef broth, I would caution against microwaving. Simply place a jar in the fridge overnight and allow to unthaw. Or you can gently heat on the stovetop. 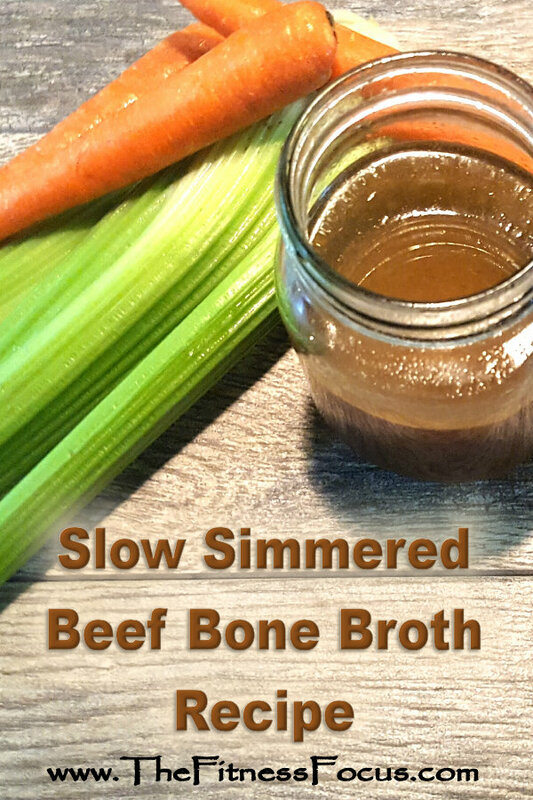 If making your own beef bone broth is just not for you, don’t worry! There are always store bought brands. Since you are basically consuming what comes from the bones of animals, it’s highly recommended to go for organic broths that have been produced from grass fed cows that have not been treated antibiotics or growth hormones. Broths labeled organic are pretty easy to find, but the grass fed part can be more difficult and will reflect in the price tag. The one brand I’ve seen that gets mostly positive reviews is Kettle and Fire (check out their site for lots of great broth articles.) I just ordered some myself to have on hand if I need beef broth quickly.